As an M.E. patient there’s a strange sense of contentment when a test comes back positive. A smug kind of “I told you so” to all the M.E. sceptics. M.E. must be one of the most misunderstood and maligned conditions that has ever existed. 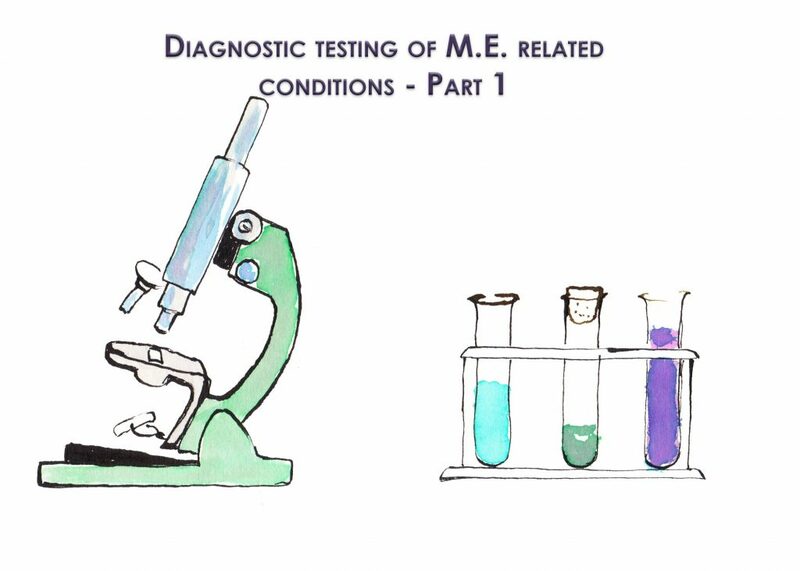 Medics argue that there is no single definitive test for M.E. Could the reason for this be that M.E. is a multi-factor condition and therefore you can’t just test one thing? I’ve given blood, surrendered almost all types of bodily fluid to science and paid a lot of money to work out what is going on in my body and it’s still not complete or clear to me. I’ve had a total of twelve tests done so far. Too many to explain in one blog post so I am splitting them up across two posts. The testing has been a bit of a journey for me and seems to fall into two parts. I’ve learned by my mistakes on this one for sure. This adrenal gland function test included cortisol, DHEA-S, fasting and non-fasting insulin, sIgA (an indicator for autoimmune disease) and pregnenolene (a precursor to other hormones). This one picked up the low cortisol levels I have all day, you can see this on the graph. Cortisol should be high in the morning, it’s what gets you out of bed, and then as the day progresses it reduces. My flat line cortisol means I wake up in the morning feeling like I’ve been awake all night. This test also came back with very high levels of sIgA a potential indicator of autoimmune disease. Their website has sample reports for you to look at (use the link above). Resulting action: Fairly gentle changes to address the cortisol issues I was having such as ensuring I get early morning sunlight to help with circadian rhythms (an alternative is a SAD lamp to combat the low light levels over winter), licorice root to suppress the degradation of cortisol in my body. Has it worked? It’s a year on and whilst I haven’t been retested these symptoms seem to have resolved for now. It’s not unusual for M.E. patients to be gluten intolerant I just didn’t think I was one of them. How wrong I was. This is one where a knowledgeable practitioner helps. I would have read this as nothing to bother with but even though the test is in the borderline range my nutritionist advised me this needed to be addressed with a strict gluten free diet. Resulting action: Completely eliminating wheat, barley and rye. Has it worked? It’s not a cure and I can’t say that I felt much better for this elimination. I have never tried to reintroduce it as the results were so definite. Iwillcome back to this issue in a later blog though as there are other subtleties around gluten that I wasn’t aware of at this point and that did make a difference. high levels of cell free DNA (this happens when you are seriously ill). DNA should be locked away in cells and not floating about in the blood. If high levels are detected in the blood then it is usually a result of an excessive amount of cell degradation. There’s a war going on inside your body and these are the leftovers. deficiencies including B vitamins, manganese, copper, zinc and magnesium….. to name a few. This test also analyses DNA adducts such as heavy metals that then need to be detoxified. Resulting action: A truck load of supplements and mitochondrial support for all the deficiencies and issues. Has it worked? In retrospect this test was never going to be the key for me but if you have only heavy metal toxicity it might be all you need. For me it was the next test below that proved the most insightful….so far. as well as even more deficiencies! Resulting action: Absolutely loads came out of this but the priority we decided to start with was the worst of the infections, Candida. This can be a debilitating infection so my nutritionist felt this could make a big difference if addressed. I went onto an anti-Candida diet (no yeast, mushrooms or fermented products e.g. vinegar) and specific anti-candida supplements including Candibactin and Candisolve. In addition to the anti-Candida changes I had to lower the oxalate levels I was eating. Excess oxalates can create kidney stones so they are definitely worth reducing since mine were sky high!! I’ll come back to dietary changes in a later blog as there is too much detail to include here. Has it worked? Nope. This made me feel awful due to the toxins produced during die-off (called a Herxheimer reaction) and did nothing to the raging infection. My GP is great and really supportive and provides this every 2 months or so. It picks up on any abnormalities in both the red and white blood cells. I’ve had everything from low haemoglobin, low haematocrit, low red blood cells, low neutrophils and raised eosinophils. This is usually done at the same time as the Haematology although not quite as regularly. It provides information to check liver and kidney function mainly. Resulting action: I think this did drive out some supplements and recommendations such as Vitamin B12. It is also very good for monitoring levels of inflammation and therefore can pick up on signs of recovery e.g. ESR levels which I have managed to half over the past year. One interesting point that I learned was that the Candida was causing my aneamia and the iron tablets were feeding the candida. Hence I was still aneamic despite turning almost magnetic (although not in personality) with consumed iron filings…. 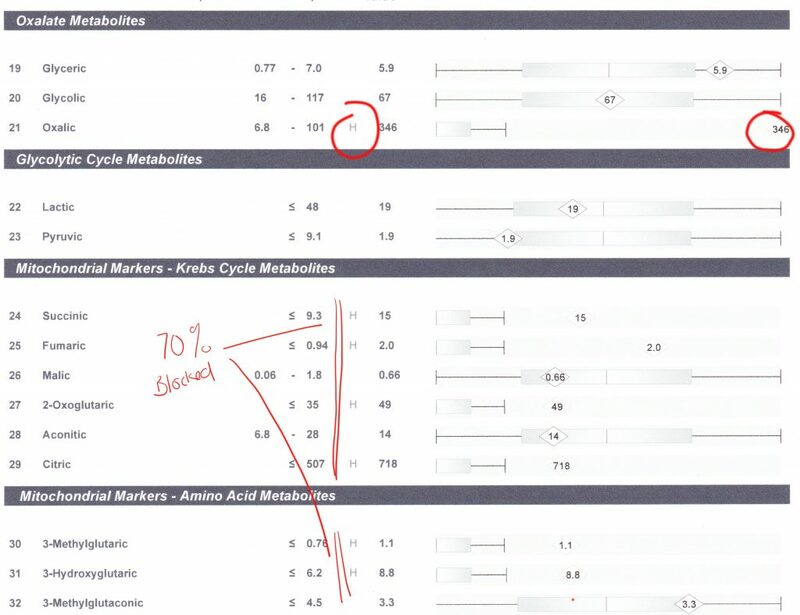 What difference did these tests make to my recovery? I had all of these tests done over a 6 month period with about 2 months between each one. The Organic Acid Test was quite significant for me in identifying underlying infections. However, as mentioned above, the anti-candida profile gave me a massive Herxheimer reaction that made me more ill. I am not entirely sure why this happened. Maybe it was because the severity of the infection wasn’t identified at this stage. These tests are point in time tests and sometimes they come up with conflicting or strange results that can be difficult to interpret. Maybe it was because my body wasn’t able to cope with the huge levels of toxins released as a result of the protocol. I was light headed, nauseous, sick, my head hurt, my spine tingled and I was back in bed for most of this time. I thought I needed to persevere and that sticking to the protocol would make me better and I so so desperately wanted to be better. This was a huge mistake. It took me months to recover from this and if I hadn’t started Hyperbaric Oxygen Treatment (read about this in my previous post here) it would have taken even longer. In part 2 I will share with you the next set of tests I have had done and what I have learned from this whole testing *pun intended* experience. Hello and thank you for all your efforts with the blog. It’s very interesting reading. I’m just starting out on this journey really although I’ve been ill a while, and am quite overwhelmed as to where to start with testing. Funds are tight.. would you suggest i go with a Nutritionist to get tests done, because obviously you need someone to interpret them don’t you. Sorry for the delayed reply. I am glad you are finding the blog interesting. I’ve just posted Part2 of this blog thread which you might find helpful. It’s quite a daunting illness as there is no NHS support or guidance. I think the most important aspect is to select a good practitioner that has experience of the condition. That could be a nutritionist or a doctor. If funds are tight, nutritionists are usually cheaper. This can work quite well if you have a supportive GP. There are lost of conditions that are misdiagnosed as CFS/ME so it’s important you address that possibility if you haven’t already done so. You can find me on instagram @myinvisibleworld if you want to get in touch direct. Happy to help if I can.